This recipe was given to me by my sister-in-law many years ago when my husband and I first got married. 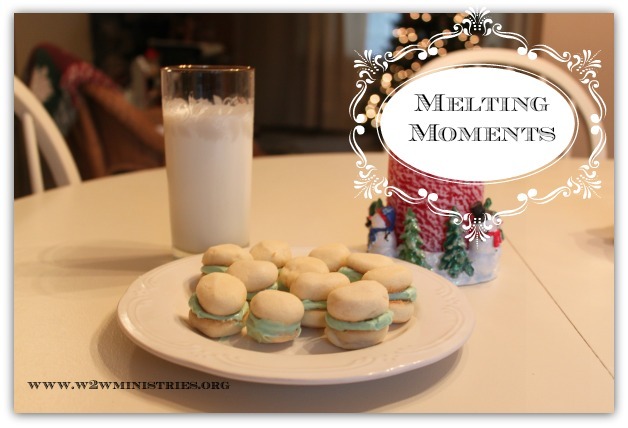 It's a delicious cookie that will literally melt in your mouth the moment you take a bite. I made a double batch for Thanksgiving and just made another batch today because my son wanted some more. They are perfect treat during the holidays or anytime of the year! Cookie- Cream butter and sugar together, add flour and cornstarch. Mix well. Let chill in refrigerator. Roll into small balls and press flat into a cookie shape, chill in freezer until set. Remove and place on cookie sheet. Bake for 10 minutes at 350*. Let cool on pan for 1 minute then place on wire racks. Frost cookie and then place another cookie on top so it forms a sandwich. Frosting- Cream sugar and cream cheese. Add vanilla and desired food coloring. Let mixture chill before frosting cookies. They sound so delicious and so easy! Can't wait to try!